Stakes were even higher after the 46-year-old rapper praised the trading app provider Robinhood in January for “putting tha Crip in Crypto!” after the company announced plans to roll out bitcoin and ether trading. 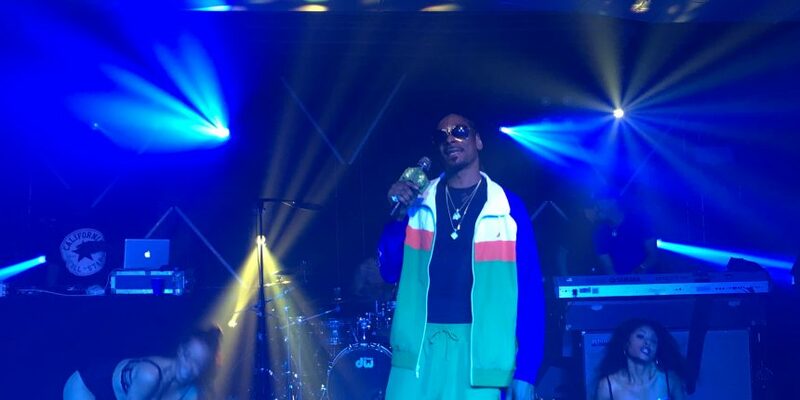 “Snoop’s a talker,” said one attendee at the party, raising his eyebrows to suggest the rapper would have something to say about XRP – or who knows, maybe even a special announcement of his own SnoopCoin. Nothing like that happened, though. It seems they were few and far between at XRP Community Night. Instead, this was a Ripple party, with a Snoop Dogg show thrown in for good measure. And the online XRP community seems to have noticed. That slightly miffed take on the event gets at the heart of the Ripple/XRP identity crisis. A couple of years ago, executives at Ripple – the company – had no problem referring to their cryptocurrency as lower-case “ripple.” But today, after the XRP rebrand, Ripple is twisting itself into rhetorical knots, trying to put its cryptocurrency at arm’s length. Given that situation, it might seem strange that there was little attempt to draw a line at the party. Ripple sponsored the event and booked the entertainment for XRP Community Night, employees in attendance told me. And about a third of the “XRP community” there were Ripple employees, all of whom wore t-shirts with the XRP logo – a disconnected X. The company logo graced the bar’s cocktail menu. (Editor’s note: Ripple contends its employees represented 10 percent of the audience, or 50 of the more than 450 registered attendees). Ripple owns “a significant amount of XRP” – the majority – Zagone acknowledged, but that was “gifted to us” by XRP’s open-source developers. The reason for these gymnastics is that, if courts and regulators find the Ripple-XRP link to be tight enough, sales of XRP – totaling $168 million in the first quarter of this year – could be considered an unregistered securities offering. A lawsuit filed earlier this month, by an investor who bought XRP high and sold low, makes that allegation (the XRPArmy greeted the news on Twitter with cries of FUD! and a few unorthodox takes on securities law). A Ripple lawyer at the party echoed some of that criticism, but used less colorful language. This is the kind of thing you can expect when there’s so much money flying around, he said, presenting as Exhibit A the Lamborghinis lining the sidewalk at CoinDesk’s Consensus conference uptown. Some people build their careers by being at the cutting edge, he went on. Other people sue. At this point, it was starting to look like Snoop Dogg might go on soon, performing for an invite-only crowd of perhaps a couple hundred techies and investors – speaking of money flying around. The smoke machines were starting up again, and what had been a faint whiff of weed was becoming truly difficult to ignore. Here was the kind of opulence that whets litigious palates. Ripple spared no expense on the light show, and Snoop was accompanied for his hour-long set by a drummer, a bassist, some hype men – including Nasty Dogg (a man in a large foam dog head) – and two scantily-clad backup dancers. One of the hype men handed out Snoop Lion rolling papers, a relic of the rapper’s 2013 pivot to Rastafarianism. Snoop has distanced himself from that phase of his life now, much as Ripple has distanced itself from XRP. It seemed a fitting metaphor: both Ripple and Snoop were tossing out little tokens of that half-repudiated identity. The difference is, in Ripple’s case it’s $168 million worth of little tokens. In Snoop’s, it’s perhaps $20. “They’re Snoop coins,” someone shouted, delighted, but they weren’t. I moved to the back of the venue to better acquaint myself with the XRP community, and spotted David Schwartz, Ripple’s chief cryptographer, playing Super Mario pinball. He seemed busy. A developer at an insurance company was free to talk, though. He used to be a “decentralization maximalist,” he said, meaning he had no patience for Ripple, but after reading the white paper, he warmed to XRP. Someone who works in business development at a South Korean crypto exchange said they were trialing xCurrent, which doesn’t necessarily use XRP – but sure, he likes it. Another crypto miner, this one in a zcash shirt, compared bitcoin to the sun and all other coins – presumably including XRP and excluding zcash – to parasites. Then again, he said he knows and likes some of the Ripple team: Schwartz and CTO Stefan Thomas, both of whom were into bitcoin early on. A British banker said his employer was doing remittances from Britain to Mexico using XRP. He was too drunk to explain, though, and got distracted by a waiter with a plate of candy. By this time Snoop was wrapping up. More than a couple of people had obeyed his injunctions to smoke weed. The men’s bathroom line snaked down the hall and onto the staircase (as with many other crypto events, there was no line for the women’s bathroom). Where were the XRP true believers? Then I spotted her, XRP Twitter’s Defender of the Faith, Tiffany Hayden, taking a selfie with David Schwartz. After they emerged, the three of us talked about Codius, Ripple Stefan’s new project Coil and Consensus 2018 (Tiffany was still sporting her badge). That’s when it came up that I work for CoinDesk. “Oh, that’s why you recognized me,” she said. And then a voice behind me said the party was over. As I made my way out onto the New York sidewalk, I felt like I hadn’t gotten any closer to understanding what makes an XRP addict tick. But that’s okay. The Snoop Dogg show was pretty sweet.